Belgian Justine Henin saw off a tough challenge from Russia's Nadia Petrova to secure a spot in the Australian Open semifinals. 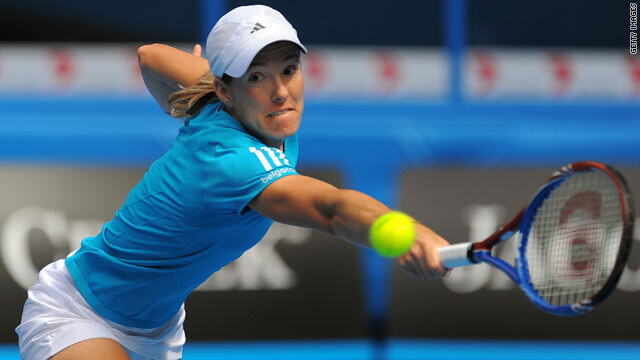 Former world number one Justine Henin fought off a challenge from Russia's Nadia Petrova reach the Australian Open semifinals. Henin will now face China's Zheng Jie who cruised into the last four with a straight sets - 6-1 6-3 -- victory over Russia's Maria Kirilenko. Zheng's compatriot Li Na followed her into the quarterfinals after stunning number four seed Caroline Wozniacki in straight sets. Defending champion Serena Williams and sister Venus remain on course for a semifinal meeting after both won to reach the quarterfinals. (CNN) -- Former world number one Justine Henin fought off a steep challenge from Russia's Nadia Petrova on Tuesday to secure a place in the Australian Open semifinals. The Belgian, who is playing in only her second tournament since coming out of retirement, narrowly edged out 19th seed Petrova in two sets - 7-6 (7-3), 7-5 - in just under two hours in Melbourne. Henin was forced to battle hard for the victory as Petrova fired off seven aces compared to four, although the Russian did make 41 unforced errors as opposed to 26 committed by her opponent. The 27-year-old admitted she was below her best in the match against Petrova, who had put out compatriot Kim Clijsters as well as Svetlana Kuznetsova earlier in the tournament. "It was really difficult to find a rhythm, but when I had to play well, that's what I did," Henin told the Australian Open Web site. "Even if you know you're not playing your best tennis, being able in the tight moments to play good tennis like I did, I think it's the key mentally. "I felt energy in a few games, and then the intensity, I lost it a little bit, especially in the beginning of the second set and I just tried to stay calm." It was really difficult to find a rhythm, but when I had to play well, that's what I did. Henin will now face China's Zheng Jie who cruised into the last four with a straight sets - 6-1 6-3 - victory over Russia's Maria Kirilenko. World number 35 Zheng made nine unforced errors compared with 20 by her Russian opponent who had struggled with a leg injury throughout the contest. Zheng is into the semifinals of a Grand Slam for the second time, following her efforts at Wimbledon in 2008 and is relishing a contest against one of her heroes. "Graf is my favorite player, number one but Justine is number three," Zheng said. "I admire her because she is so strong mentally. I enjoy watching her play. I think it will be a very tough match for me, a big challenge, but I like it." Earlier Zheng's compatriot Li Na followed her into the quarterfinals after stunning fourth seed Caroline Wozniacki in straight sets. Li ensured that two Chinese players reached the last eight of a Grand Slam event for the first time in history with a 6-4 6-3 victory over the Danish teenager. Serena powered to a 6-4 6-2 win over Australian Sam Stosur to book a meeting with Belarusian Victoria Azarenka, who recovered from a set down to beat Russia's Vera Zvonareva 4-6 6-4 6-0 in two hours and 28 minutes. Sixth seed Venus had more trouble in her fourth-round match, and the American dropped the first set to Italian Francesca Schiavone before she recovered to claim a 3-6 6-2 6-1 victory and will face Li.